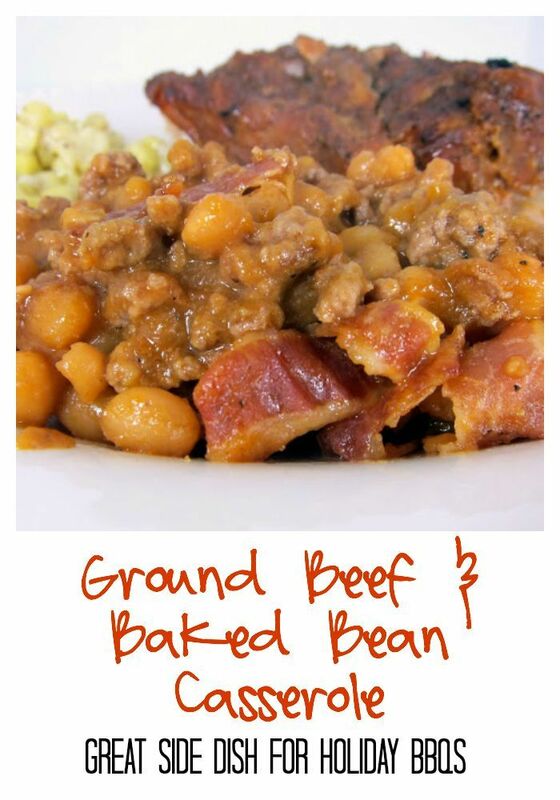 Ground Beef and Baked Bean Casserole Recipe - ground beef, pork and beans baked in a homemade bbq sauce and topped with bacon. Perfect side dish for holiday BBQs. Can make ahead and bake when ready. No BBQ dinner is complete without a good side of baked beans. We served these beans with the ribs we posted yesterday. We both loved these beans. They reminded Chicken Legs of the Tequila Beans at J. Alexander's, his favorite. The beans have a wonderful flavor and are a breeze to make. You might want to double the recipe if you are feeding a crowd. Chicken Legs ate almost half of the pan by himself! Preheat oven to 350°F. Coat a 2-quart casserole dish with cooking spray; set aside. In a large skillet, cook the beef; cook about 10 minutes or until brown, breaking meat up with a fork as it cooks. In a large bowl, combine the beef with the remaining ingredients except the bacon; mix well. Pour beef mixture into casserole dish; arrange the bacon slices on top. Cover with a lid or aluminum foil. Bake about 45 minutes or until thick and bubbly. This reminds me of the ones we've been making since I was a kid. Momma always put bacon on them like that. She used regular mustard instead of dijon. I like this recipe. Another bookmarked. We have a J Alexanders nearby. I'll have to try those beans next time I'm there. yep, baked beans are a prerequisite for grillin'! These look good. Never had tequila beans before. Also I agree, plain mustard, and I prefer fresh onions, but this is just the good old standard baked beans like they cook in the south. If you really want a good tangy flavor add a 2-5 tablespoons of white vinegar. That gives it that sweet/sour flavor. HOLY heck Chris, was looking at your little picture next to your comment, and you just kind of reminded me of 'home' and I'll be darned, a Tennessee boy. I am from TN and living in Sweden the past year. Looking up a good southern style baked bean recipe (really just to re-verify I didn't forget). The food in Sweden is as bland as 1950's american cooking. ;P I mean just awful. Diced potatoes with some kind of creamy stuff that has NO flavor whatsoever and then add fish chunks. No salt, no onion, garlic, just GAG. There is no BBQ HERE !! I am from Memphis, dude, where there are probably as many BBQ places as gas stations !! A BBQ restaurant would be SO popular here. Pulled pork I mean !! I am definitely going to check out your recipes and bookmark your blog!! I make these but mine has molasses and no bacon. I use it as the main course with roasted potatoes and cole slaw. My mom taught me to make these when I was very young. She got the recipe from my grandmother. Now my daughter makes them...4 generations. Must be a fabulous recipe...LOL. We use a little more ketchup and just yellow mustard. This is so easy I don't even measure anymore. Mom called hers "Bean Pot" because she did actually cook them in a bean pot. I hope lots of people try this recipe because it is easy and delicious. I am making them this weekend for Labor Day.